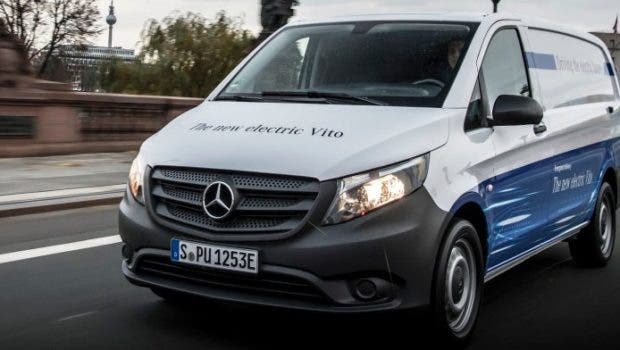 Electric versions of all of Mercedes-Benz Vans’ commercial van model lines are now planned — with deliveries of the eVito beginning in late 2018 and deliveries of the eSprinter beginning in 2019, and others following — according to a new press release. The electric vans won’t come cheap, though. The eVito will apparently start at €39,990 (US$47,000) in Germany (and this figure doesn’t include VAT), so it’s hard to tell as of now how well it will sell. Pre-ordering for the new model is now active, with the first 1,000 preorders being granted a free service package (which includes a wallbox). As far as range goes, the eVito will reportedly possess a range of around 150 kilometers (~93 miles) per full charge — achieved through the use of a 41.4 kilowatt-hour (kWh) battery pack. Though, that range can get down to 100 km (62 miles) in low temperatures. Mercedes-Benz adds: “The battery can be fully charged in around six hours, while an output of 84 kW and up to 300 newton metres of torque deliver dynamic performance. When it comes to top speed, the customer can choose between two options: A maximum speed of 80 km/h fulfils all requirements in city traffic and urban areas, while conserving energy and increasing range. If more speed is needed, the customer can choose a top speed of up to 120 km/h. As one would guess, the battery packs to be used in the eVito and the eSprinter will be supplied by Daimler subsidiary Deutsche Accumotive — and more specifically from the lithium-ion battery production plant in Kamenz (near Dresden).